Sen. Shelley Moore Capito’s granddaughter Celia made the rounds on Thursday for Take Our Sons and Daughters to Work Day in the Capitol. 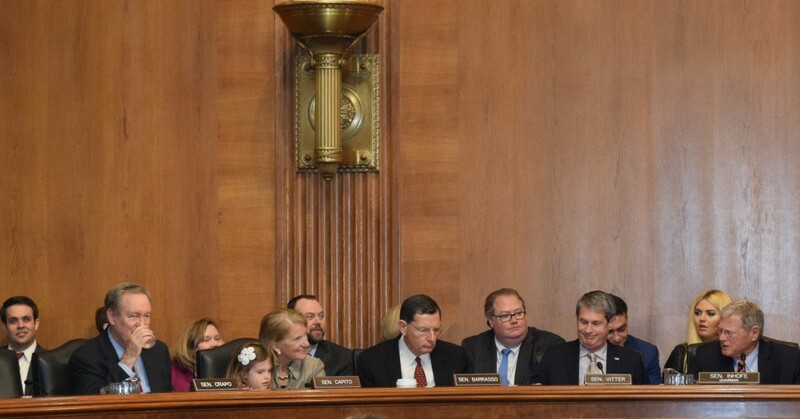 At a 9 a.m. markup in the Environment and Public Works Committee, the West Virginia Republican held six-year-old Celia on her lap the entire time. Around 15 minutes in, ranking member Sen. Barbara Boxer pointed out the young politician-in-training. “Before I put our latest guest to sleep, I’ll stop,” the California Democrat said, pointing to Celia. 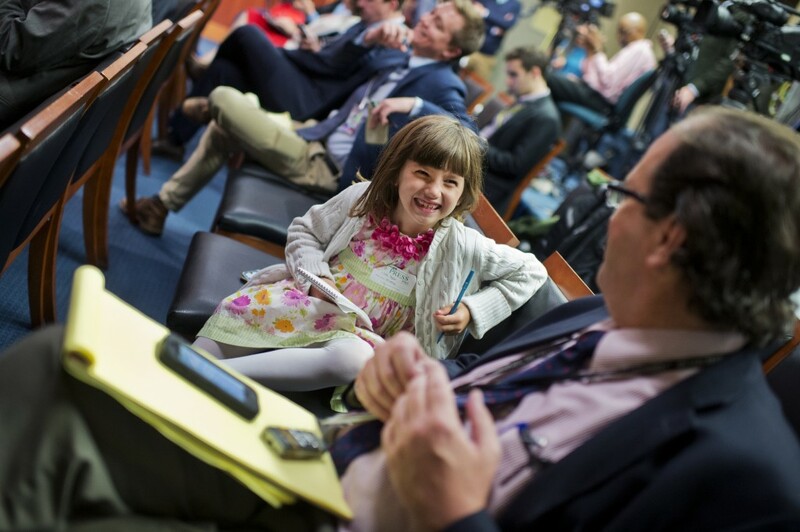 Celia responded, “I’m good.” Among themselves, Inhofe and Boxer discussed how adorable she was. Boxer asked Capito if she got her from a casting call or if she was real, drawing laughs around the room. Later in the day, Celia hit up lunchtime. Hosted by the Foundation for Advancing Alcohol Responsibility, children swarmed the top floor of Hart for chicken fingers and games. Celia took photographs with the Washington Nationals&apos; Racing Presidents and two Olympians supporting the cause, three-time national figure skating champion Ashley Wagner, and U.S. soccer star Lauren Holiday, a two-time Olympic gold medalist. The event was aimed at promoting healthy lifestyles and saying no to underage drinking. Capito and Sen. Al Franken, D-Minn. had sent out a Dear Colleague letter on Friday announcing the activities for the day. Children were able to visit the Senate floor at 8:30 a.m., have breakfast and talk to the Capitol Police. Children under the age of five were invited to story time with Sen. Heidi Heitkamp, D-N.D.
For House Speaker Paul D. Ryan’s press conference Thursday morning, members of the press were encouraged to bring their children along. The kids excitedly left the galleries with their parents and about 10 of them attended, some with reporter&apos;s notebooks. To the girls in dresses with ribbons in their hair and the boys in collared shirts, the Speaker said they could stick around and ask questions afterward. One reporter was observed trying to coach a little girl into asking Ryan if he was going to run for president. Stephanie Akin contributed to this report. Get breaking news alerts and more from Roll Call on your iPhone or your Android.